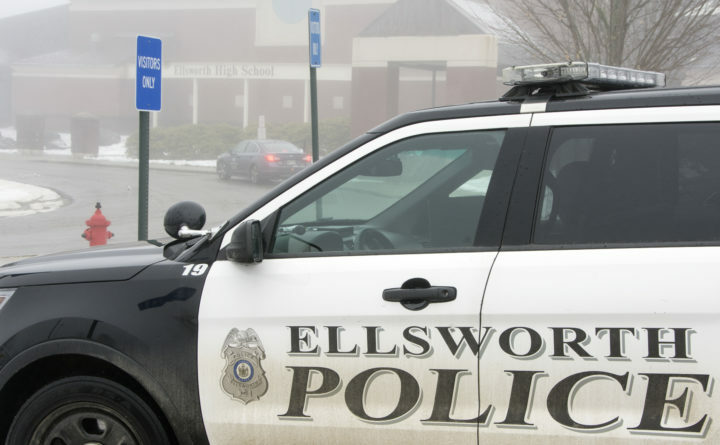 An Ellsworth police cruiser sits parked outside the local high school in this February 2018 file photo. Two juveniles, including a student at Ellsworth High School, were arrested Thursday on charges of conspiracy to commit murder after making threats in an online chatroom about committing violence against another person. The threats came to the attention of Ellsworth school officials and police on Wednesday, Ellsworth schools Superintendent Dan Higgins said Friday morning in a statement. The resulting investigation concluded late Thursday evening, he said. One of the boys is a 14 year-old from Ellsworth, and the other is a 16-year-old from Brewer, according to the Ellsworth Police Department. The names of the arrested juveniles were not released because they are not legally considered adults. Conspiracy to commit murder is a Class A crime in Maine, punishable by up to 30 years in prison and a fine up to $50,000. Maine State Police assisted in the investigation and the Hancock County District Attorney’s office was consulted on the matter before the charges were filed, Higgins said. Police said both boys were arraigned in court in Ellsworth on Friday. The Ellsworth boy, who is on probation for an unrelated offense from last year, will remain under house arrest while the Brewer boy has been released to the custody of his grandparents. It was not clear Friday morning if the person targeted in the threats was logged into the online chatroom at the time the threats were made. The person targeted in the threats does not appear to have been a student or a staff member in the city’s school system, according to Higgins. Nor were there any threats about committing violence at any of the city’s schools.